How do you attend more networking events? Start with meeting someone you met at a prior event for coffee. If you’re like me you struggle with networking events. Maybe it’s our introverted nature. I know there are some of my fellow introverts out there. Doesn’t it just seem like some people love networking events? It’s like they feed on the energy of other people and they really thrive by being around people. It’s not that I don’t like people. I love people, but after some time I start to feel drained and I need to recharge my batteries by getting away and being alone. Awhile ago I wrote about how to get more out of networking events. I realize now that I kind of left out an important part: going to more networking events. Obviously you can’t get more out of the events if you’re not going. 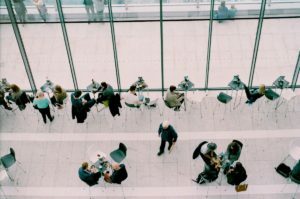 So here are some tips I’ve used to kind of encourage myself (that sounds better than tricking myself) into going to more networking events. One trick I’ve used to attend more networking events is to go with a friend or someone I know. I can see how it could work in the opposite way – attending events solo. I guess I’m fond of the crutch of knowing at least one person at the event. It kind of helps me break my icy exterior at the event. I can chat with them for a bit and then move on. Or I’ve used the friend, perhaps one that’s more outgoing than me, to introduce me to others. This introduction usually helps foster conversations with new people. Here’s one that builds on the previous point, but I’ve used this to pretty good success. That university connection I just mentioned. I went to an event at the university for business students. I went by myself and met a few people. It was good. I connected with one person there and asked if they had any other events coming up in the area. They perked up and were happy to tell me about the next event and we both ended up attending. Now I had a person to kind of introduce me to other people. And I also had an obligation to go. This definitely forced me to attend the event where if I would have just put it on my calendar I may have been more likely to blow it off. This one is actually kind of interesting. I didn’t really expect this to happen, but it was positive. I went to an event with my wife. She’s a web designer and while she has clients all over the world she has a few local clients. With Ghost Blog Writers, we really haven’t had local clients. So even going to a local event was kind of foreign to me. The people there were kind of different from me. They were local business owners and I was kind of this curiosity to them. But that kind of worked out pretty good. They asked great questions and I could kind of tell my story. And because they were kind of different from me it also kind of made me ask more questions. And actually this happened at another event. My wife took me to a design event with other designers. I was definitely the outsider there, but everyone was really curious and it made conversation easier. Go to events where everyone is different from you. I’ve found that it makes for a great experience. There’s something often done in sales. Instead of focusing on the closes, the focus is on the output. What I mean is that instead of the number of sakes, the focus might be on the number of cold calls. The salesperson might have the goal of making 100 calls a week or something like that instead of closing one sale a week. The reason for this is that the 100 calls are in the salesperson’s control. The sale isn’t really 100% in the salesperson’s control. The other person has to agree to buy. The big BUT though is that if you have some history you know that the stats show that if your salespeople make 100 cold calls that they’ll average one new client…or whatever it might be. So instead of focusing on getting something out of networking events. Go into it with something that’s more in your control: the number of events you attend. Now you can look back at your success when you set a goal to attend five events per month and you achieve that goal. The outcomes from attending will come as a result. This is the big one for me. I probably could have put it at the top of this list. In sales it’s all about the lead pipeline. You want a consistent way to have leads coming in so you can talk to people and close deals. once the pipeline shuts down the sales shut down. The same is true with events. You need a consistent way to learn about events so you can add them to your schedule. I’ve always found that once something is on my calendar that I’m pretty likely to go. I kind of blindly follow my calendar. Anyway, a good one for me was subscribing to the university’s email newsletter where I live. They send out notices about events all the time and most are pretty appealing. There is also this local periodical, Volume One, that is really good at promoting events. Your chamber of commerce. Your local small business group. Leagues. There are a number of ways to subscribe to pipelines of events. I kind of mentioned this earlier with asking questions, but it’s worth having its own point. I’ve always kind of struggled telling my own story or talking about myself. The more events I’ve attended the better I’ve gotten at my story and things like that, but I’ve tried to work on my question asking skills. I try to get people talking about their businesses and their passions. People like talking about their passions. I like talking about my passions even. Learn to ask more questions and it’ll make it easier to attend more events. You can kind of practice on friends and family and you’ll find that conversations start to improve and that will give you confidence to attend more events. This was an interesting idea I heard. And I’ve seen it work. At one of the university events in town I met some pretty interesting guys. They saw the value in attending networking events, but they were a bit frustrated by them. They thought they could create an event that had more of the types of things they wanted. So they created their own event. I thought that was a pretty cool idea and it’s good if you’re introverted or if you like being in control. By having your own event you control more and probably will feel more comfortable in the setting. This has been a good one for me. I guess you could call one-on-ones networking events. Why not? I’ve had a couple of these in recent years. I reconnect with someone that I’ve known in the past like a high school or college friend. We just meet up and have coffee or something. When you already know each other it seems that the conversation gets off to a good start and you can build from there. And this kind of bleeds into the next tip. I think the point of going to networking events is to build relationships. That’s really what life is about in many ways. Going to events is one step, but taking things to the next level is even better. So maybe you could start by reaching out to people you’ve met at prior networking events. Shoot them a quick email to see what they’ve been up to. See if they want to grab coffee sometime or see if they’re going to an upcoming event. I did a little more digging in the GBW archives and came across a tip that I wrote about a couple years ago and I still use it today. And it works! The tip is to have short conversations with people at networking events and then moving the conversation to email. It doesn’t work with everybody, but it works more often than you might think. I’ve done this before where I meet someone for the first time say at a University event in the town where I live, Eau Claire, Wisconsin. It’s a university town and I’m an alum so they have regular events. If I meet people and the conversation goes pretty well for a couple minutes I’ll get their card and from there I’ll just followup quickly via email. If the person responds it’s a good sign that the relationship could go somewhere. We’ll maybe email back and forth a few times and it can often lead to meeting again to discuss business or whatever. If you go into the event with this in mind it’s less “scary” and draining. You know that you’ll keep things short and that things will move to the “safer” medium of email. Networking events have been a positive for me. I’ve met some great people and it kind of gets me out of my introvert tendencies and that trains me for other areas of business like sales. So if you see the value in attending events, but are struggling to attend more of them then hopefully these tips will help. I’ve found them helpful over the years. In fact, I could probably follow them a bit more often.